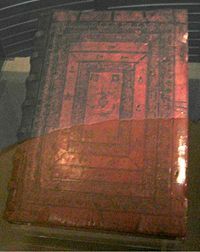 The Gutenberg Bible (also known as the 42-line Bible or the Mazarin Bible) is a printed version of the Latin Vulgate translation of the Bible that was produced using movable type by Johannes Gutenberg, in Mainz, Germany in the fifteenth century. Although it is not, as often thought, the first book to be printed using Gutenberg's movable type system, it is his major work, and has iconic status in the West as the beginning of the "Gutenberg Revolution" and the "Age of the Printed Book." Before Gutenberg died in 1468, printing presses like his were at work making books in all the great cities of Europe. 2.2 The printing process: "Das Werk der Bücher"
The advent of the printed Bible ushered in an age in which Bibles, and books of all types, became accessible to ordinary people, and knowledge was no longer the exclusive domain of the wealthy and privileged elite. Today the Internet has brought about another revolution in writing; it is no longer necessary to print a physical book or use a printing press to transmit written knowledge; it can be typed by an author and made instantly available to millions of people in every part of the world. Early in the fifteenth century, wood-block printing began to replace hand-copying as a means of reproducing books. Each page was carved on a single wood block, which was then rubbed with ink and pressed on to the paper. Johannes Gutenberg (c. 1398–c. February 3, 1468) devised a new type of printing press using movable type, in which blocks with individual letters were cast in metal and arranged side-by-side in a frame to form words. By 1450, the press was in operation, and a German poem had been printed. Gutenberg began work on a printed Bible in 1452. 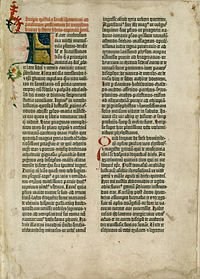 In 1455, Gutenberg published his 42-line Bible, commonly known as the Gutenberg Bible. Early documentation states that a total of 200 copies were scheduled to be printed on rag cotton linen paper, and 30 copies on vellum animal skin. The exact number of copies printed is not known; it is believed that at least 180 copies were printed, 145 on paper and the rest on vellum. Today, only 22 copies are known to exist, of which 7 are on vellum. A contemporary account by a visitor to Mainz indicates that the book was nearly ready in October, 1454, and available for sale by March, 1455. The Bible sold for 30 florins each, which was roughly three years' wages for an average clerk. Nonetheless, it was significantly cheaper than a handwritten Bible that could take a single scribe over a year to prepare. Most copies were probably purchased by churches and monasteries. In 1455 (possibly starting 1454), Gutenberg brought out copies of a beautifully executed folio Bible (Biblia Sacra), with 42 lines on each page. The pages of the books were not bound, and the date 1455 is documented on the spine by the binder for a copy bound in Paris. The name "42-line Bible," shortened to B42, refers to the number of lines of print on each page, and is used to differentiate this edition of the Gutenberg Bible from the rarer 36-line Bible, which is also referred to as a Gutenberg Bible. The term "Gutenberg Bible" is most commonly used to refer to the more familiar 42-line edition. This Bible is the most famous incunabulum (book printed in Europe before 1501) and its production marked the beginning of the mass production of books in the West. The Bibles were printed, then rubricated (highlighted with red text) and illuminated by hand, the work of specialized craftsmen. Gutenberg produced all 180 copies over a period of one year, the time it would have taken to produce one copy of the Bible in a Scriptorium. Because of the hand illumination, each copy is unique. A complete copy comprises 1,282 pages, and was bound in two volumes (one known copy is bound in three volumes). Currently, 48 copies are known to exist, not all complete. The locations of these copies are listed below. First page of the first volume: The Epistle of St. Jerome. The page has 40 lines. The paper size is "double folio," with two pages printed on each side (making a total of four pages per single paper). After printing the paper was folded once to the size of a single page. Five of these folded papers (carrying 20 printed pages) were combined to a single physical section, called a quinternion, that could then be bound into a book. It is possible that the some sections were printed in a larger quantity, especially those printed later in the publishing process, and sold unbound. Page numbering was not used in the Gutenberg Bible. The binding technique was not new, since it was already used to make books of blank pages to be written on afterward. Printing required determining beforehand the right position and orientation of each page on the five papers, so that they would end up in the right reading sequence. Mechanical printing also required getting the location of the printed area in the correct position on the page. The folio size, 307 x 445 mm, has the ratio of 1.45. The printed area had the same ratio, and was shifted out of the middle to leave a 2:1 white margin, both horizontally and vertically. Although this bible is named B42 because it has 42 lines to the page, not all pages have 42 lines by design. Pages 1 to 9 and pages 256 to 265, probably the first printed, have 40 lines. Page 10 has 41, and from there the 42 lines appear. The actual printed area remains the same whether it has 40, 41 or 42 lines; only amount of space between the lines changes. B42 is printed in the blackletter type styles that would become known as Textualis (Textura) and Schwabacher. The name “texture” refers to the texture of the printed page: Straight vertical strokes combined with horizontal lines, giving the impression of a woven structure. Gutenberg used the technique of right-justification by putting extra white space between words, so that all the words lined up against the right-hand side of the column, forming a vertical line. He allowed punctuation marks to go beyond that vertical line, so that the massive black characters made the justification appear stronger to the eye. Gutenberg's oil-based ink, made sufficiently thick enough to cling to the type, was exceptionally black because of its high content of metal. In some copies of the Bible, the headings at the top of a few of the sheets are printed in red; the initial pages were re-composed, and the later copies for those pages are in black only, with the red headers lettered by hand. On all later pages the red headings are added by hand, and a printed list of the text to be added to each page survives. This, presumably, represents a failed experiment. All the main capitals, were handwritten and illustrated on the places that were intentionally left white, a process called rubrication. The spacious margin allowed handmade illustrations. The printing process: "Das Werk der Bücher"
The idea of using reproducible and reusable types was in itself a valuable invention, and Gutenberg was the first European to implement it. Gutenberg’s greatest achievement, however, is that he proved that the whole process of printing could actually produce books. There were multiple problems to be solved, each of which could have derailed the whole process. In a legal paper, written after the production, Gutenberg refers to the printing as Das Werk der Bücher (The Work of the Books). A single complete copy of the Gutenberg Bible has 1,272 pages; with 4 pages per folio-sheet, 318 sheets of paper are required per copy. The 35 copies printed on hemp required 11,130 sheets. The 155 copies on paper required 49,290 sheets of paper. The handmade paper used by Gutenberg was of fine quality and was imported from Italy. Each sheet contains a watermark, which may be seen when the paper is held up to the light, left by the papermold. Some copies of the Bible were printed on vellum (scraped calfskin). The first part of Gutenberg’s idea was the use of a single, hand-carved character to create identical copies of itself. Cutting a single letter could take a craftsman an entire day, so a less labor-intensive method of reproducing type was needed. Copies were produced by stamping the original into an iron plate, called a matrix. A rectangular tube was then bound around the matrix, creating a container into which molten lead could be poured. Once cooled, the solid lead form was released from the tube. The end result was a rectangular block of lead with the form of the desired character protruding from the end. This piece of type could be put in a line, facing up, side-by-side with other pieces of type. These lines were arranged to form blocks of text, which could be inked and pressed against paper, transferring the desired text to the paper. Each unique character required a master piece of type that could be replicated. Including the uppercase and lowercase forms of each letter, and the number of various punctuation marks and ligatures (for example, the sequence "fi" combined in one character, commonly used in writing) the Gutenberg Bible needed a set of 290 master characters. A single page has about 500 words, and 2,600 characters. Two pages must be available simultaneously to print a single sheet of paper, requiring a total of 5,200 characters at any one moment on the press table. The scholar John Man describes a calculation of the number of pieces of type required. While one sheet of two pages was on the press, another two pages were in preparation to be set (5,200 characters). The previous two pages that had been printed were in decomposition after printing, requiring another 5,200 characters. At any moment during the process, six pages containing 15,600 characters altogether were in existence. Such a large number was probably mass-produced by making copies of one set of master-type. The number of presses in Gutenberg's shop is unknown, but the sheer volume of pages he needed to print suggests that more than one press must have been in use. A skilled typesetter selected the individual pieces of type for each line of the text and set them in a frame (the forme), which was placed on the bed of the press and then inked with horsehair-stuffed balls. A sheet of paper was slightly moistened before being placed over the forme, and then a stout pull by the pressman completed the printing process. In the past, there was no consensus on the order of editions. 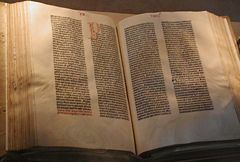 Some specialists like Richard Schwab and Thomas Cahill argued that the rarer 36-line Bible was actually the older, cruder version, and that the 42-line Bible was a second, more numerous and perfected edition of Gutenberg's Bible. Others, like Richard W. Clement, argued that the 36-line Bible was printed in 1458, 3 years after the 42-line Bible, but with an older typefont. The dispute, however, has been settled; the line endings on the pages of the 36-line Bible make it evident that the text is based on a copy of the 42-line Bible. As of 2007, 48 Gutenberg 42-line Bibles are known to exist, of which 21 are perfect. This includes eleven complete copies (four of which are perfect) on vellum, and one copy of the New Testament only on vellum. In addition, there are a substantial number of fragments, some as small as individual leaves—at least one copy is known to have been broken up to be sold in parts. The country with the most copies is Germany, which has 12; the United States has 11 and the United Kingdom 8. Mainz, Russia and the Vatican City have 2 copies each, Paris and London have 3 copies each, and New York has 4 copies. Three identified copies have been lost—two disappeared from Leipzig after the end of World War II, and one is known to have been destroyed along with the library of the Catholic University of Leuven in 1914. The two from Leipzig have been rediscovered in recent years, both in Moscow, where they had been taken. A full listing of known copies and brief details on their condition can be found in the British Library's Incunabula Short Title Catalogue, ISTC number ib00526000. The 36-line bible is cataloged as ISTC number ib00527000. Copy numbers are as found in the ISTC, taken from a 1985 survey of existing copies by Ilona Hubay; the two copies in Russia were not known to exist in 1985, and so were not cataloged. A more detailed census, with some notes on provenance, is online at Clausen Books. "Perfect" or "imperfect" refers to completeness—whether a volume still contains all its leaves. Germany (12) Gutenberg Museum, Mainz 8 One copy is vol. I, imperfect, paper; the other both vols., imperfect, paper. It is unclear which is which. Württembergische Landesbibliothek, Stuttgart 10 Imperfect, paper. Purchased in April 1978 for 2.2 million US dollars. University of Texas at Austin 39 Perfect, paper. Purchased in 1974 for 2.4 million US dollars. In the 1920s, a New York book dealer, Gabriel Wells, bought a damaged paper copy, dismantled the book and sold sections and individual leaves to book collectors and libraries. The leaves were sold in a portfolio case with an essay written by A. Edward Newton. (Also referred to as a "Noble Fragment.") These leaves now sell for $20,000–$100,000 depending upon condition and the desirability of the page. On October 22, 1987, a Japanese buyer, Eiichi Kobayashi, a director at the Maruzen Company, purchased the Old Testament portion (Hubay 45) for $5.4 million at a Christie's Auction. The last sale of a complete Gutenberg Bible took place nine years before, again at Christie's, for $2.2 million. For other works printed by Gutenberg or from the workshop he founded, See: Johannes Gutenberg. ↑ 1.0 1.1 John Man, Gutenberg; How One Man Remade the World With Words (New York: John Wiley and Sons, Inc., 2002, ISBN 0471218235), 312. ↑ Gutenberg-Bible.com, The History of the Gutenberg Bible. Retrieved October 15, 2008. ↑ Lesley B. Cormack and Andrew Ede, A History of Science in Society: From Philosophy to Utility (Broadview Press, 2004, ISBN 1-55111-332-5). ↑ University of Texas, University of Texas—The Gutenberg Bible. Retrieved October 15, 2008. ↑ Albert Karp, Johann Gutenberg: The Man and his Invention, 3rd ed (Solar Press, 1996, ISBN 1-85928-114-1). ↑ University of Texas, University of Texas -The Gutenberg Bible. Retrieved October 15, 2008. ↑ Robert Buderi, Beaming in on the Past, Time Magazine (March 10, 1986). Retrieved October 15, 2008. ↑ Orb Online Encyclopedia, 36-Line Bible. Retrieved November 7, 2008. ↑ Kapr, Johannes Gutenberg (Scolar, 1996). ↑ Kenyon College Library, Incunabula. Retrieved November 7, 2008. ↑ New York Times, A Gutenberg Bible Sells for Record Price. Retrieved October 15, 2008. British Library. The Gutenberg Bible. Treasures in focus. London: British Library. 2006. ISBN 0712349537. Karp, Albert. Johann Gutenberg: The Man and his Invention, 3rd ed, Solar Press, 1996. ISBN 1-85928-114-1. Man, John. Gutenberg; How One Man Remade the World with Words. New York: John Wiley and Sons, Inc., 2002. ISBN 0471218235. Thorpe, James Ernest. 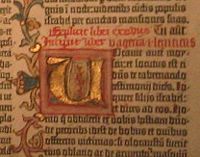 The Gutenberg Bible: landmark in learning. San Marino, CA: Huntington Library, 1999. ISBN 0873281691. This page was last modified on 21 July 2017, at 15:14.